Wow, just wow. When my mother called last night we talked about making her fruitcake together--she's too old to do it by herself any more. I think I'll bring along the ingredients to do this one too!!! Thanks, PG. And great photos as well. Does anyone know why it must be baked? It doesn't seem to have any ingredient that would benefit by the oven, as it's all melted and mixed already. ? Thank you! I added a pinch of cardamom to the recipe because I just had to. Of course you did. It would be irresponsible not to. Thanks everyone for stopping by. I love hearing from everyone. june2, that's a great question. You want to bake out the flour and create a lighter texture. 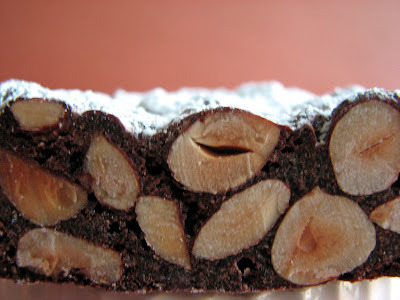 Panforte is a confection but not quite so heavy. Baking also develops the aromatics of all those lovely spices. op99, I can't stop laughing! Thank you or writing that the sugar and honey mixture must be heated to 240F (125C?). I have seen several recipes were it should be heated above boiling water, and it doesn´t seem logical, as it souldnt become hot enough. I tried it, and it didn´t turn into anything like a ball! I will now try again. Hi zanahoria! Actually, 240 degrees F is equal to about 115.5 Celsius. The main thing is to keep it in the soft ball range. Please do try again and I hope this works for you. 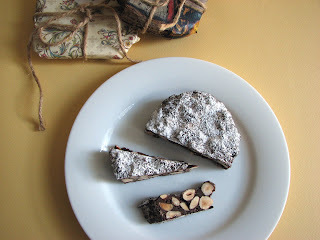 This panforte is a real treat. Wow - this looks incredible - just like we had when we were in Sienna. . . . the memories flood back. This is the most delicious recipe. What texture is panforte supposed to have? Hardness, chewiness, etc. When I made it, it turned out sort of how I'd imagine fresh tootsie roll to be - firm verging on hard ball stage after baking. I bought it once and it was kind of rubbery/flexible (and bland, but that's a different issue fixed by never bothering with another recipe). I've also had it hard enough to make me fear for my dental work. I liked my consistency the best, but was curious about what I should be shooting for. Thanks. Hi anonymous! I'm so thrilled that you made it. The taste and the scent are incredible. It's actually kind of hard to describe the texture, but I think you got it right. It's sort of chewy but also a tiny bit hard, crunchy, almost like a cross between a cookie and a candy, but not....! Hope you enjoy every last piece. I made the recipee twice but it hasn't stiffened from the outside at all. So now I have to serve it with a spooon. It's too sticky. Does anybody know what has gone wrong?